"I make this every year for my family on St. Patrick's Day. Delicious and filling!" Pour the apple juice into a large slow cooker, and mix in the brown sugar and mustard, stirring until the brown sugar has dissolved. Mix in the contents of the spice packets, and lay the briskets into the apple juice mixture. Top with red potatoes, carrots, onions, and cabbage chunks. Push all ingredients into the liquid. Cover and cook on High until corned beef is very tender, 4 to 5 hours; or cook on Low for 8 to 10 hours. Slice meat thinly across the grain, and serve with vegetables. 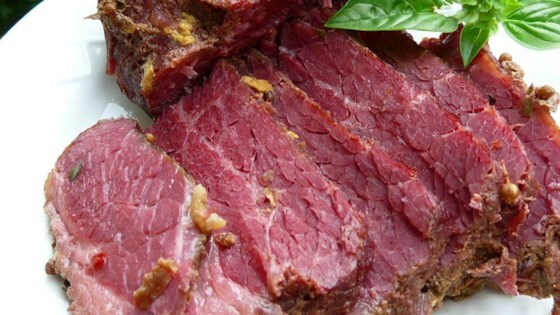 Perfect corned beef brisket is super simple to make at home. For stovetop cooking, place meat, apple juice, brown sugar and mustard in a large covered stockpot. Bring to boil, reduce heat and simmer, covered, for 40 minutes per pound of meat. Add veggies for last half hour of cooking. This was by far the best corned beef I ever tasted. Only change I made was to add 1 cup of beer to make sure everything was completely covered. Outstanding!